If there is anything that is shaking the foundation of not just Nigeria but the entire universe at the moment, it is the synergy exhibited through the resolve of Indigenous People of Biafra (IPOB) under the supreme and unshakeable command of Nnamdi Kanu The Great. Government of federal republic of Nigeria under the Pharaoh of West Africa, Rtd Major Gen. Muhammadu Buhari has exhausted all the options in their disposal to break the unity or the synergy existing in the people of Biafra, but Biafrans understand the leadership of Nnamdi Kanu has vehemently refused to be broken, displaced, intimidated, suppressed and compromised. Where are the voices of Gen Yakubu Gowon Rtd, Gen Olusegun Obasanjo Rtd, Gen T. Y. Danjuma Rtd and many others who called Biafra restoration project a joke, thereby leading the clueless maximum ruler of Nigeria into errors which will consume Nigeria soonest? Are they still calling the struggle a joke? No! The struggle has become the greatest nightmare to Aso Rock and a serious threat to the foundation of the defunct Nigeria. Instead, Gen Obasanjo was spotted few weeks ago begging Biafrans to drop the agitation so that Nigeria will look into their plight in Nigeria, but the time for that is gone as everything under heaven has its own time and season. Gen. Buhari was also spotted begging the NYSC members in his village at Daura Katsina state to go plead with their people in Biafraland to forget Biafra, when the Youth Corpers are starving by buying a cup of rice ₦150. Well, all of us have untidily said that the only thing they can stop the tornadoes of requisition of our people is not looking into our plight in one Nigeria that is already dead and laid in grave awaiting burial sand but the restoration of Biafra. Come Friday September 23, is going to be the greatest demonstration of Biafrans once again that we want Biafra. As our God ordained leader, Nnamdi Kanu The Great is going to appear in Federal high court, Abuja presided over by the most corrupt judge of the century, Justice John Tsoho on September 26th, for the corrupt judge Tsoho to continue his caricature on Nigeria judiciary from where he stopped in June. All Biafrans all over the world have in one voice agreed to protest in capital cities of countries across the world to show the world that we are no longer interested in Nigeria and at the same time register a displeasure over continuous detention of our leader Nnamdi Kanu against court verdicts ordering his unconditional release. In the same vein, all Biafrans residing in Biafraland and other parts of the defunct Nigeria have accepted to observe a SIT-AT-HOME directive given by IPOB Directorate of state, the only government at the moment commanding full respect of all Biafrans, unlike Nigeria government that compels us by force to do anything. We are hereby calling on United Nations, Africa Union, European Union, ECOWAS, and Common Wealth of Nations to as a matter of urgency prevail on the government of Nigeria to begin the process of dialogue through peaceful restoration of Biafra. The ugly experiences of perennial massacre of Biafrans since 1945 of Jos massacre of Igbos to the present day state sponsored terror being carried out by government of Nigeria through the instrumentality of its armed forces and DSS-shielded Fulani herdsmen all over Biafra land, dubious government policies which frustrates us from maximizing our God given potentials, nepotism in distribution of political offices in Nigeria against Biafrans, terrorism of Islamic Boko Haram terrorist attacking us because we want to worship our God and many other things necessitated our vehement resolve to restore Biafra. We hereby invite the international community to come to Biafraland and observe the compliance of Biafrans to this sit at home protests and have first hand information because Nigeria media of lies and deceit will want to deceive the world on the true happenings. 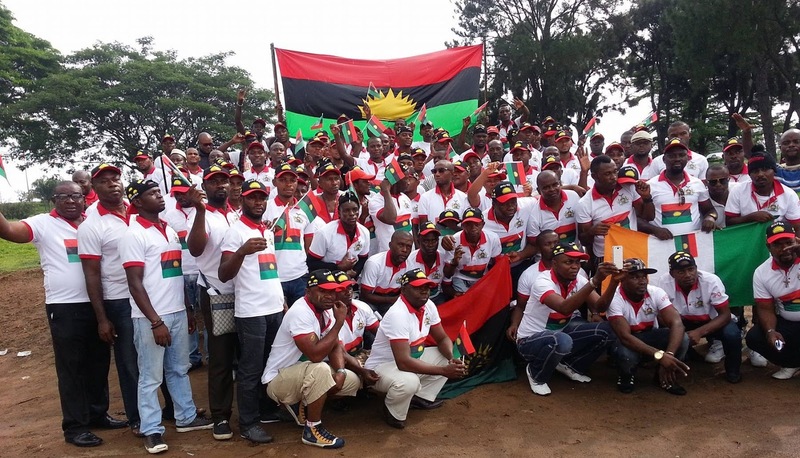 Biafraland is going to be shutdown tomorrow from Asaba to Warri, to Yenegoa, to Port Harcourt, to Uyo, to Calabar, to Ogoja, to Abakaliki, to Enugu, to Onitsha, to Owerri, to Aba, to Umuahia, to Okigwe, to Nnewi, to Awka. Biafrans in Abuja, Kano, Lagos, Jos, Ibadan, Kaduna, etc have also vowed to stay at home that day in solidarity to Mazi Nnamdi Kanu. All we are saying is release Nnamdi Kanu and give us Biafra and peace will reign.